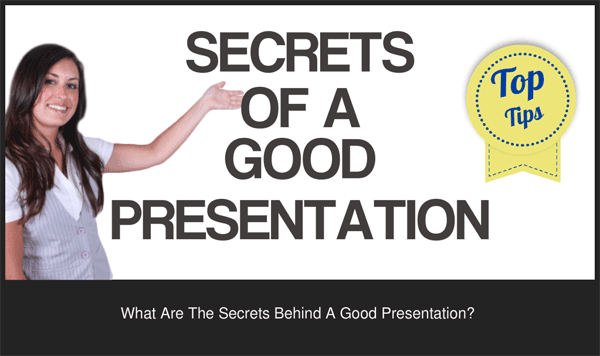 The question, “is there a secret to giving a good presentation?” is easily answered. The answer is, “no”. Because, there’s no secret. It really is that simple. Is There A Secret To Giving A Good Presentation? Giving a good presentation is much like anything else at work or in life. You need to work at it. Then invest in your skills and finally, take the time to learn what’s needed. Because there’s really no big secret. So, when you want good presentation results it pays to invest. Therefore, invest in your planning, preparing and researching your audience. Planning your presentation is vital. And so is your rehearsal, so that you are fully familiar with your presentation. And that’s it. There’s no secret to giving a good presentation. It’s an amazingly simple and easily understood communication skill. You’ve seen it yourself. Because when you’ve watched a good presentation you just know the presenter has spent some time and effort getting their presentation right. It’s really obvious that they are prepared, ready and practised. This Mahatma Gandhi presentation is one such presentation. The presenter aimed for a good presentation and then delivered it. So, What’s The Secret To A Good Presentation? Take your time, plan and prepare. Know your audience. And remember to rehearse your presentation. And with all that done you can feel your own confidence grow as well. Take your time, plan and prepare. So, that’s it. That really is the secret to a good presentation. You can learn more skills and techniques for giving a good presentation on a presentation skills coaching one to one session at a time and place that suits you. Because, with more than 40 training venues to choose from you are never that far away. Or, as an alternative, you can choose to organise a corporate training day at your offices. Because that’s always a good way to stretch a training budget and keep your whole team involved. So, when the time is right, please don’t hesitate to get in touch.